The boys are already looking forward to St. Patrick's Day, which means we've been doing some fun, little things already to get ready to celebrate. 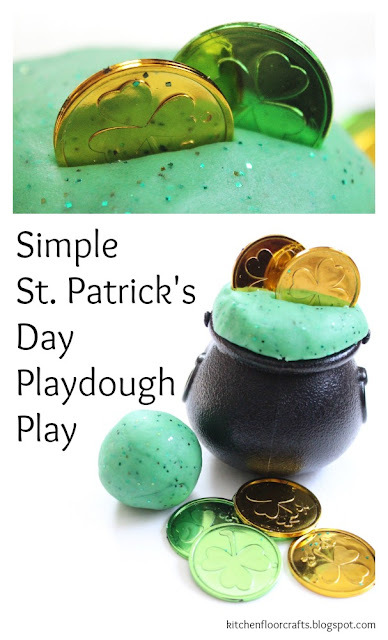 Which is how we came up with this Simple St. Patrick's Day Playdough Play invitation. 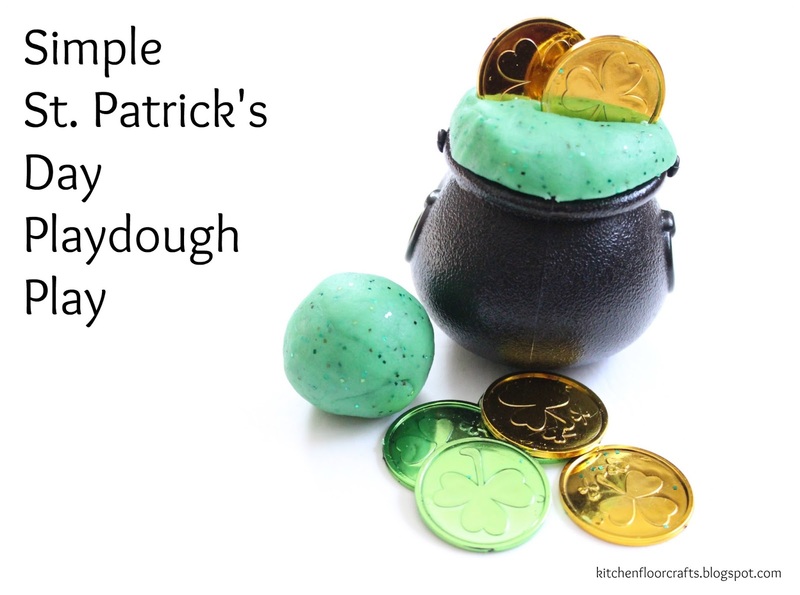 As with most of our playdough recipes we started with our Basic Cooked Playdough recipe and then tweaked it a little to make it match the St. Patrick's Day theme. To begin with, I made a fresh batch of our Basic Cooked Playdough. 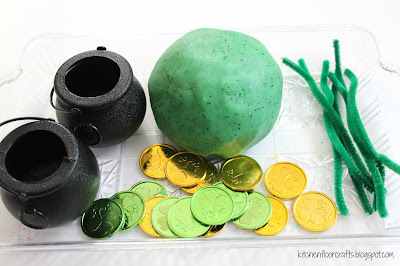 To make it ready for St. Patrick's Day I added green food coloring and green glitter. 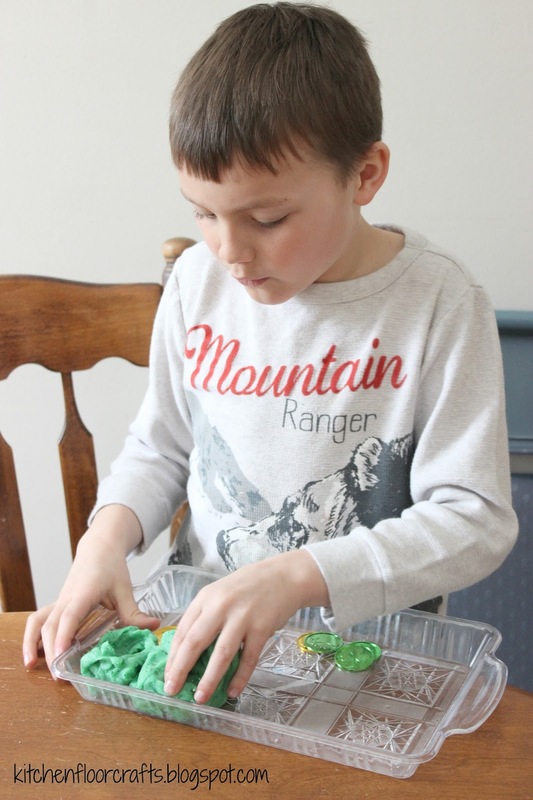 In our recipe I recommend adding the food coloring to the water before cooking the mixture. I also recommend adding the glitter after cooking, when the playdough is first being kneaded. 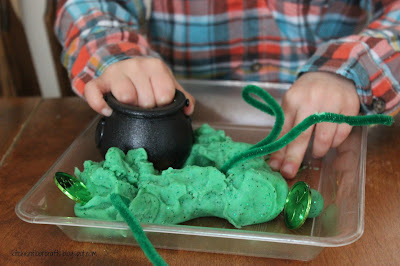 In addition to the green, sparkly playdough we added some mini plastic pots, plastic shamrock coins, and half strips of green pipe cleaners. 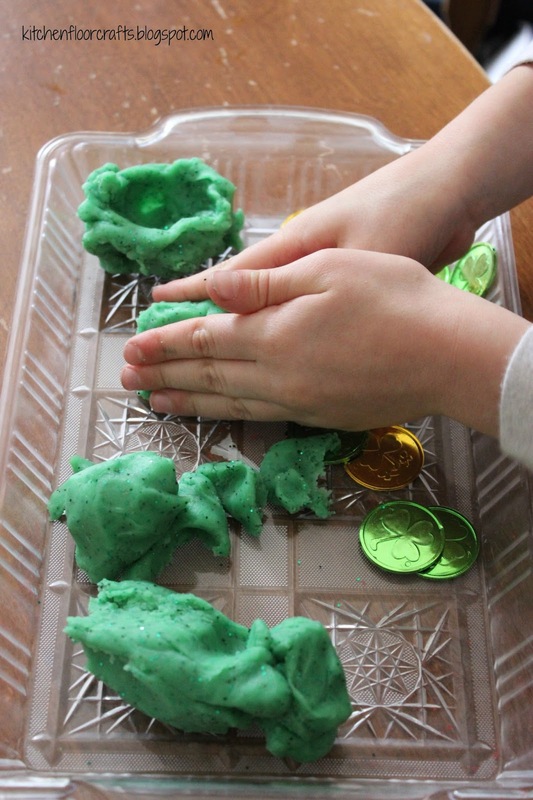 The coins were instantly popular. They can be easily found this time of year at craft stores and party stores, we found ours at JoAnn Fabrics. 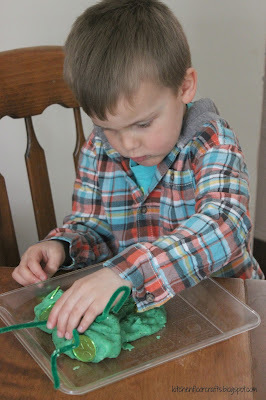 The boys each took half of the supplies and started creating. Each one had their own idea of what they were creating. 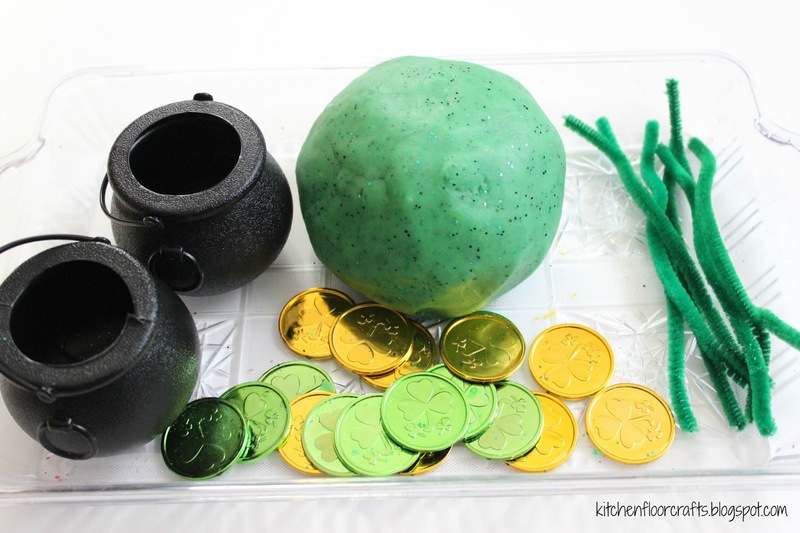 Big Brother attempted to build is own leprechaun pot out of playdough, and then switched over to building a bank which could hide the money. Little Brother was more interested in just playing with the different pieces. Although in the end he created some type of leprechaun home. I can see that this will be a great game to come back to over the next few weeks. 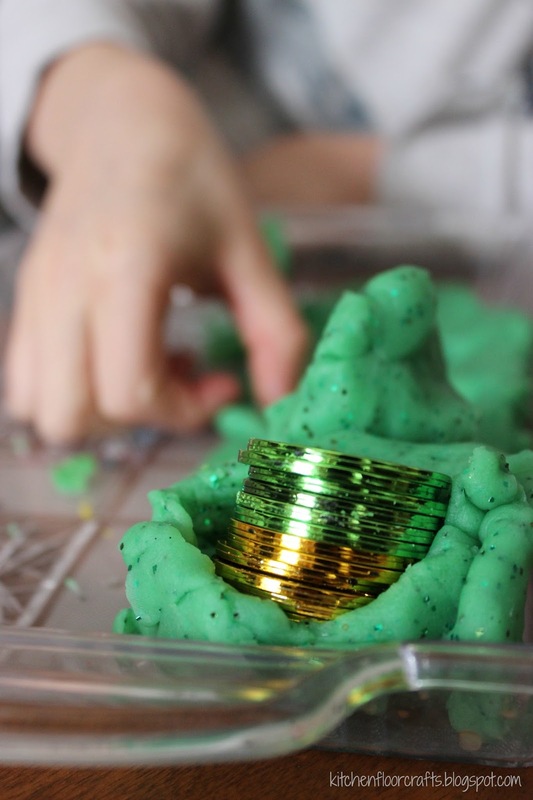 The materials are simple, but leave room for open ended play. Keep your eye out for some other simple St. Patrick's Day activities in the coming weeks!